We only see one side of the moon due to the tidal locking of the Moon to Earth. However, we get to see a little more than half the moon. Due to lunar libration we see about 59% of the Moons surface. This libration is due to the dynamics between the Earth and Moon. The video shows a simulation of one phase cycle of the Moon. In actual terms the Earth has a diameter of 12 742km and is 40 075km around the equator. That may sound large but in the scheme of the solar system it is it not that big. In the terms of the universe it is totally insignificant. This video compares the size of the objects in our solar system and to other stars. Ever wanted to take your own photos of the night sky but never knew how. This video gives a very brief explaination of what is involved to get started in this exciting hobby. Just be aware that there is a huge difference in skill level from where he starts (ie a camera on a tripod) to where he finishes. It is very easy to use a camera on a tripod. It takes a lot more determination and money to take good photos like the ones towards the end of this video. Using the Hubble Space Telescope (HST) and the Very Large Telescope (VLT) scientists have found a galaxy that is 13.1 billion light years away. To date this is the most distant galaxy found. Since the light has taken 13.1 biliion years to reach us we are seeing how the galaxy was when the Universe was only 600 million years old. Not only is that impressive but it tells us the galaxies had formed by that time placing restrains models for the formation of the Universe. The image below shows the location of the galaxy on the Ultra-Deep Field image taken by the HST in 2009. I posted the full version of this image on the 4th of October. The post is called Hubble Ultra Deep Field. This video is a short documentary on the Collisional Ejection Theory for the creating on the Earth’s moon. It features Bill Hartmann and Robin Canup who were important figures in the development of this theory. Ever felt insignificant? If you have an understanding of what is presented in this image you should. Nearly every object in this image is a galaxy containing millions and in most cases billions of stars. The image is called the Hubble Ultra Deep Field and was taken in 1995 and 1998. The objects in this image are extremely dim and not detectable by ground-based telescopes. Even the Hubble Space Telescope cameras had to collect light over 278 hours to produce this image. 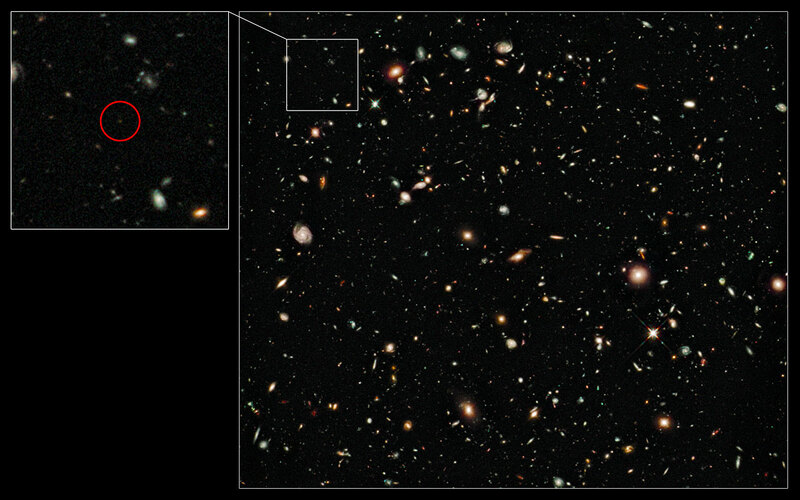 There are 10,000 galaxies in the image. Using this image it has been estimated that there are 130 billion galaxies in the Universe at least as bright as the dimmest galaxy in the image. For a larger version click the image. 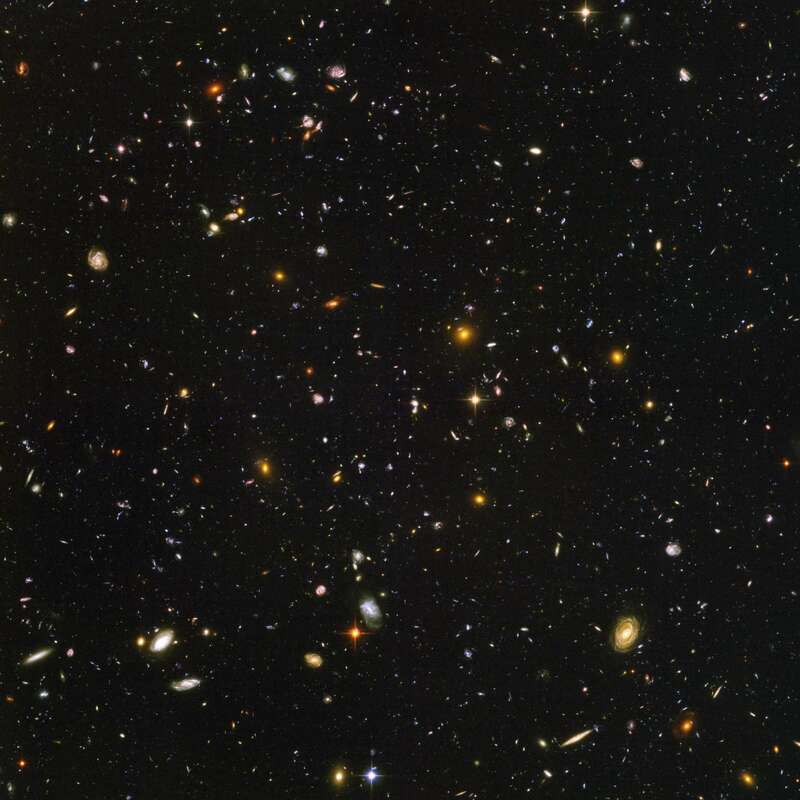 For a very large version (60MB) see the Hubble Ultra Deep Field image. Today every point on Earth has a day and night of very nearly 12 hours for each. This is called an equinox and since this one occurs in September every year it is called the September Equinox. It is also called the Autumnal Equinox in the northern hemisphere as it marks the onset of Autumn. Only one other equinox occurs every year and it occurs in March. Obviously this is called the March equinox. It is also referred to as the Vernal Equinox and in the northern hemisphere marks the start of spring. Equinoxes occur when the tilt of the Earth’s of rotation is at a right angle to the line connection the Earth and Sun. This can only occur twice in a single orbit of the Earth around the Sun (ie one year). At the time of each equinox the Sun lies at the intersection of the plane containing the Earth and Sun and the plane defining the Earth’s Equator. In the figure on the right the blue plane is defined by the Earth’s equator. The yellow plane is the plane containing the earth and Sun (the line the Sun appears to follow is called the ecliptic). The position of the Sun at an equinox is marked as Autumnal and Vernal Equinoxes on the figure. Today the Sun is at the pointed marked as Autumnal Equinox. This video deals with the Hibiru Hoax. This hoax relates to a planet which is approaching Earth and will cause a major extintion event at some point. Original dates for this has already past. The latest manifestation of the hoax is that the planet will cause havoc on Earth in 2012. This date coincides with yet another doomsday predicted event in 2012 with the end of the current Mayan calendar. Don’t be fooled by this hoax. There are two explanations that the hoaxers claim is the reason why proof for Nibiru is non-existent. The first is that every profession and armature is somehow in a conspiracy to keep its presence a secret. The other is that it is on the other side of the Sun. The first reason doesn’t even warrant a reply. I can’t explain why it is that we did not see Nibiru when we where on the same side of the Sun as the planet 6 months ago. 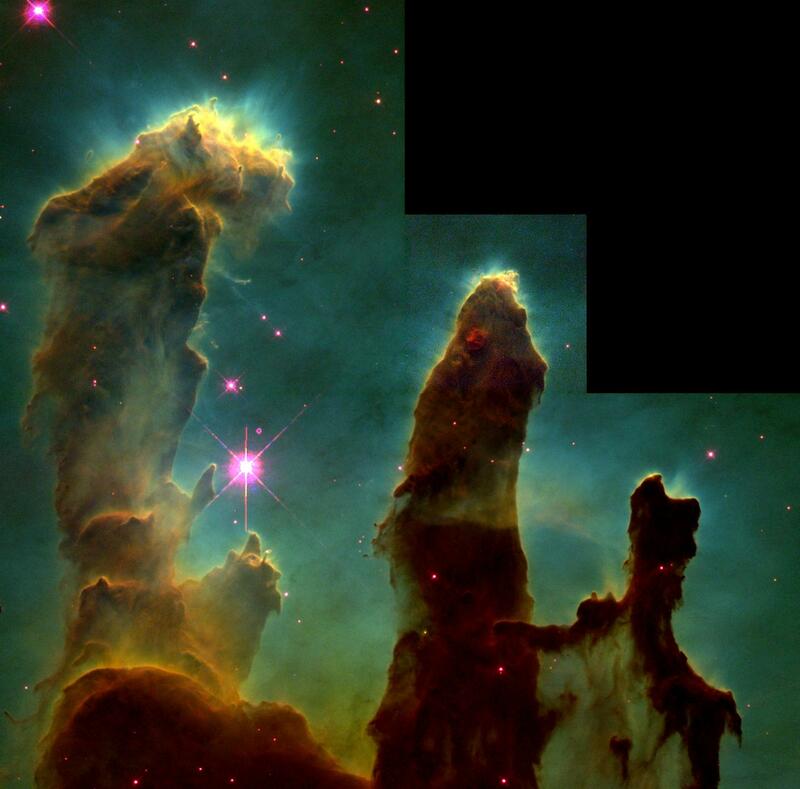 The Pillars of Creation is one of Hubble’s most famous images. I don’t think any astronomy site collecting information from various sources is complete without this image. It is very awe inspiring. I will add more information about what is in this image soon. 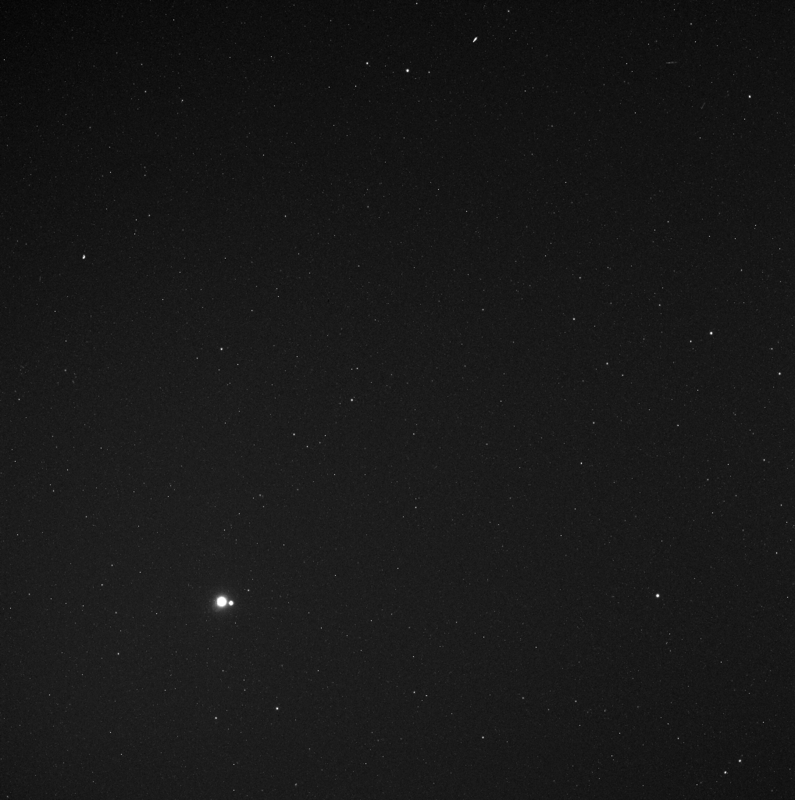 This is an image of the Earth and Moon from a distance of 138 million kilometers (114 million miles) by the MESSENGER spacecraft. They are located in the bottom left of the photograph.